But the best news to come out of last night’s event at New York’s Time Warner Centre was that the ship will spend its debut summer season in the Mediterranean. Carnival has not had a ship in Europe since 2013; it blamed its withdrawal on higher airfares which deterred American customers, and it struggled to create an identity among UK consumers. The 133,500-ton Vista, which will carry almost 4,000 passengers, is to operate 18 sailings in the Med, beginning with a 13-day cruise from Trieste to Barcelona on May 1, 2016. The remaining voyages, of 8, 10 and 12 days will depart from Barcelona and Athens throughout the summer visiting ports including Dubrovnik, Izmir (Turkey), Corfu, Livorno, Marseille, Messina, Corfu and Malta. Vista will leave Barcelona on October 21, 2016 for a 13-night Transatlantic crossing to New York, but its final homeport is still to be disclosed. As for the ship itself, it’s largely a matter of something old, something new, something borrowed, something brew. Let’s explain that last bit first: Vista is to have its own brewery on board, supplying the Red Frog pub with three different varieties of beer. Something old? 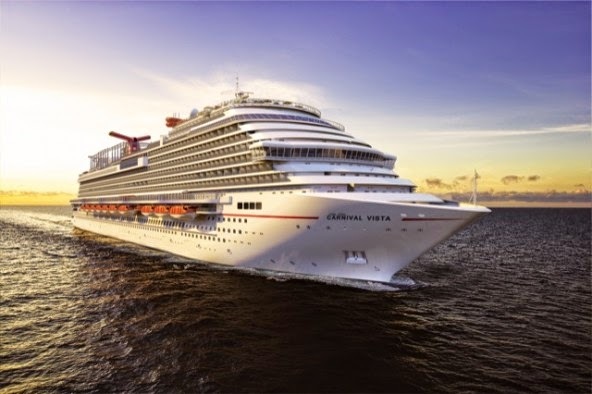 Count in that bar and a number of other food and drink venues that debuted on Carnival Breeze and which have been rolled out across other ships in the fleet as part of the Fun Ship 2.0 programme. Think Guy Fieri burger joint and Cucina del Capitano Italian restaurant for starters. Something new? The first IMAX cinema at sea will be part of Vista’s multiplex, and the three-deck high screen will show first-run movies at the same time as their mainstream release ashore. 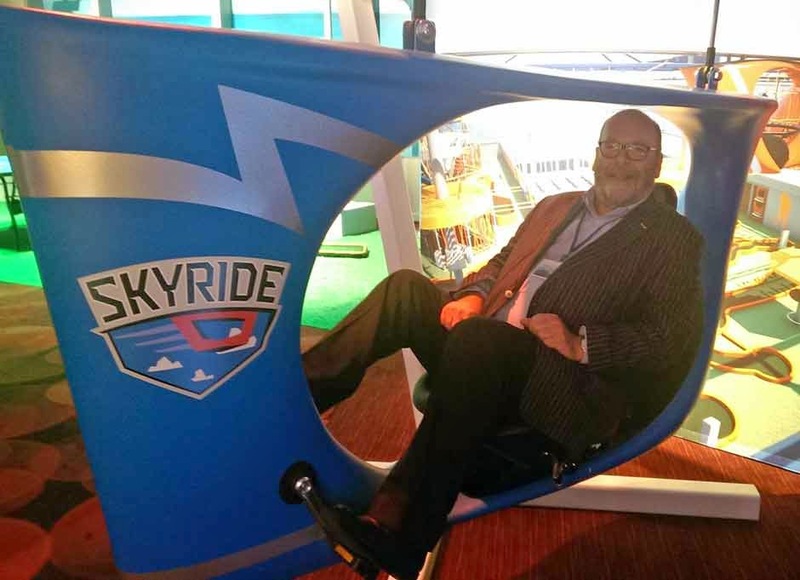 Another first is SkyRide, a pedal-powered roller coaster (above) encircling the ship’s ropes course. The dual track is 800 feet long and 150 feet above the waves. Senior cruise director and brand ambassador John Heald, from Essex, hosted the reveal, but declined to confirm whether he would be the launch cruise director. “It’s a young man’s game,” said John, who was celebrating his birthday on Thursday. Tamis said Vista was Carnival’s most innovative ship yet, but many of its features – including the al fresco dining out on a wide promenade deck, and the creation of family staterooms – are ideas borrowed from rival operators such as Norwegian and Royal Caribbean. 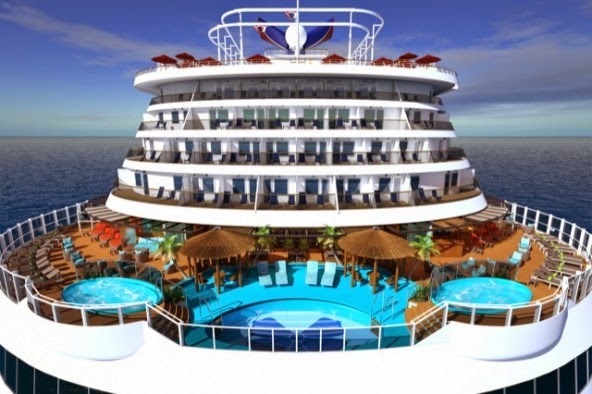 Vista will have 72 suites, 880 balcony staterooms, 293 cabins with an outside view, and 723 interior cabins. Its WaterWorks fun zone incorporates a 455-ft tube slide and a 300-ft twidter spiral slide. SkyRide encircles a suspended ropes course. The main Reflections dining room seats 1,474 passengers, while the Horizons restaurant accommodates 702. Speciality restaurants include Cucina del Capitano, Fahrenheit 55 steakhouse, Bonsai Sushi, and the JiJi Asian Kitchen. The poolside Lido Maketplace incorporates a pizzeria, BlueIguana Cantina, Comfort Kitchen, Carnival Deli, and the Guy Fieri burger joint.